I (Oktovianus Pogau, a journalist at suarapapua.com and a freelancer for The Jakarta Globe) will report on a beating that I experienced, perpetrated by police in Manokwari, West Papua. On the 24th October, 2012, at around 16.00 Eastern Indonesian Time, I was accompanied by three journalists, two from Cahaya Papua (Duma Sanda and Patrick Tandilerung) and one journalist from Tabloid Noken (Jo Kelwulan) to Manokwari police station to meet with the Chief of Police for Manokwari, AKBP Agustinus Supriyanto S.Ik, as had been arranged on the evening of Tuesday (23/10) with the officer. The Chief of Police had initially stated that he was not aware if members of the force had beat up journalists, then, when many journalists from Jakarta began to call the station inquiring about the incident, Supriyanto became adamant that there were no beatings of journalists by police. Then, continued Supriyanto, 5-10 minutes later at around 20.00 Eastern Indonesian Time, there was a brief message from me to his phone (whereas I sent him an SMS at 13.29 WIT, 30 minutes after the beating) which stated that there had been a beating and that my neck had been strangled while I was covering an action by Komite Nasional Papua Barat (KNPB) (National West Papuan Committee) on Tuesday 23/10 in front of Kampus Universitas Negeri Papua (Unipa) (Papuan State University) which was supporting an international lawyers meeting in London. 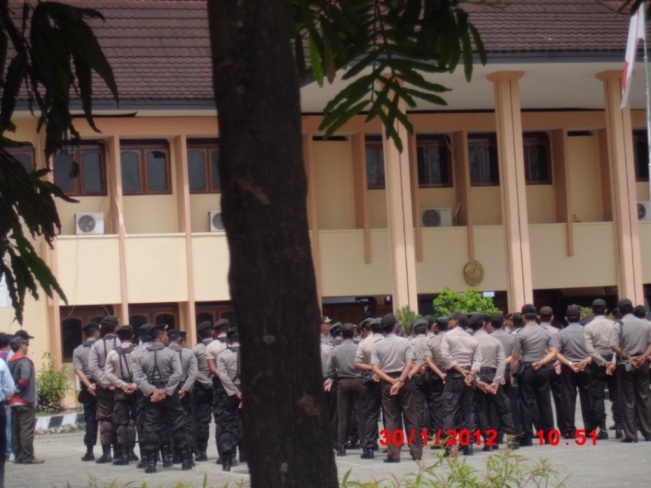 Then, the Chief of Police conveyed himself as the supervisor and manager of all the police in Manokwari, Papua Barat, and didn’t question that the media publish (when shown the news headlines in Cahaya Papua which detailed the violence perpetrated by members of the police force against me) news about the aforementioned incident. Supriyanto said that the relationships between all journalists in West Papua, particularly in Manokwari, is really good, and because of this, he personally regrets the incident of the beating, and in fact, was surprised that a member of the force would do something like this to a journalist. Supriyanto said that he wished to offer a personal apology for the incident. He also said that there was also a possibility that the incident occurred because the police didn’t realise I was a journalist, and that they were also carried away with the emotion of the moment. Because of this, the Chief of Police firmly requested that I identify the men responsible for the incident so they could be subject to due legal processes, as in line with my request. However, Supriyanto also suggested that the case didn’t have to be resolved amicably, that is, to be resolved by making peace with the offenders. According to the chief of police, it could be a rather difficult process to find the offenders, as there were many members in the force, and certainly no-one would be honest, but he said again that it depended on me. After the chief of police opened this conversation, he gave us all the chance to talk. Duma Sanda explained that there was an issue of freedom of the press, in which the work of journalists is universal, meaning, it doesn’t mean that just because I didn’t live and become a journalist in Manokwari, I didn’t have the right to cover the demonstration by KNPB. Duma also firmly requested that the Chief of Police teach the men to respect the profession of journalism, and also to respect journalists like myself. And, to make himself clearer, Duma also requested that the Chief listen to a chronological account of the beating I experienced. I introduced myself (officially) to the Chief of Police. I told him about my work writing news for the paper Papua Pos Nabire and Tabloid JUBI during high school, about writing several columns in Tabloid Suara Perempuan Papua, the newspaper Bintang Papua, along with Papua Pos Nabire. And I conveyed to him that I’d also covered stories for The Jakarta Globe and that this is still continuing, and then that I established suarapapua.com as an online media outlet. I explained to the Chief of Police in chronological order the incident of the beating (you can read my previous email). After this, I conveyed a number of important issues to the Chief of Police that have to be understood about the incident of the beating. I said that firstly, his men had violated the article KUHP on disorder; secondly, the men had violated article UU Kebebasan Pers 1999 (UU on Freedom of the Press 1999) by preventing the work of a journalist; thirdly the UU anti-discrimination; and fourthly, Intelligence didn’t have the authority to capture let alone beat someone and certainly they violated their work code. Because of this, I requested that the problem not be resolved amicably/peacefully, but should be followed up through a more direct process of law. I said that it was important that the police officers be aware, and law enforcement officers should be an example, that if there are officers who are at fault, then they have to be punished as criminals so that the public can know. Questions are being raised again about the willingness of the Indonesian police in Papua to properly investigate suspicious shooting incidents by “Unknown persons”, after a German born Spanish citizen was shot by a sniper and critically injured whilst swimming at a popular tourist beach in Jayapura. The scientist identified as Pieter Dietmar Helmut (55) was swimming with his wife and some West Papuan friends at Base G beach, when a man brazenly drove up to beach in a silver Avanza car (plate number DS 1852) and shot the man three times in the thigh, abdomen and chest from a distance of ten metres – allegedly with a rifle according to some witnesses, though this could not be independently confirmed. According to witnesses, who spoke to Indonesian media outlets and West Papua Media, the man was ethnic Papuan, but human rights sources insist that this does not prove that he was a member of any pro-independence forces. Rather, according to a stringer for West Papua Media’s stringer in Jayapura, this proves that this Papuan is able to openly use a vehicle that is easily identifiable and yet receives no punishment for his actions, pointing to the likelihood he is an active member of the security forces. “The man, who had curly hair and was unshaven abruptly stopped his vehicle near us. He got off the car and shot my husband three times,” Helmut’s wife Eva Mediana Pachon was quoted as saying by the state-run Antara news agency. Elsham reports that around 10.00 a.m., Dr. Pieper and Eva Pachon were enjoying their day at a popular beach in Jayapura named Base G. It started to rain so most of the other people began to leave the beach. After swimming Dr. Pieper and Pachon packed their bags while waiting for the rain to stop. They intended to head straight back to the city. As they were sitting under a small hut, Pachon noticed a vehicle on a road behind the beach. “We saw a vehicle going by slowly, passing us three or four times. It was an SUV, the car was silver coloured,” said Pachon. The vehicle then stopped, a bearded man—an ethnic Papuan wearing a camouflage jacket and hat—came out and started walking toward them. Pachon noticed that her husband had been shot only after seeing his body was covered in blood. “The man came near to us, about ten metres away, and then he shot Dietmar [Pieper] twice. I was shocked when I saw him fall and moan, saying ‘I am going to die. I am going to die.’ and I saw blood flowing” she said. According to Elsham, the perpetrator got back into the car after shooting Dr. Pieper, but did not immediately leave the scene. Pachon thought that the perpetrator wanted to shoot her as well, so she initially ran towards a more crowded area to ask for help, Elsham reported. “Pachon then returned with bystanders who helped take Dr. Pieper to the Jayapura General Hospital where he underwent a medical operation which lasted 47 minutes. Medical sources and Pachon report that Dr. Pieper had two gunshot wounds—in his left thigh and one on the left side of his torso. The first shot reportedly entered his back on the left side and went through to his chest on the left side. The second shot reportedly went through his left thigh. Medical sources also say that the bullet went through the lungs of the victim, making a hole less than half a centimetre wide. As of close of business on Wednesday May 30th, the victim is in a stable condition in an intensive care unit. Four armed policemen are guarding his hospital room,” according to the Elsham report. Despite the clear identification of the suspect, Indonesian Police in Jayapura have refused to name any suspects, instead blaming “unknown persons”, a well-known euphemism in Papua for highly-trained shooters whose identity is well-known but enjoy complete impunity for their crimes. Initial reaction to the shooting amongst Papuans widely puts the blame for the shooting at the hands of Indonesian security forces, who are seeking to turn international condemnation by Germany, Canada, Britain, the Netherlands and France against Indonesian human rights violations in Papua. “It is the same tactic that was seen with the US after they suspended arms sales after the East Timor bloodbath, and put caveats on the resumption of military assistance to be conditional on significant human rights reform. 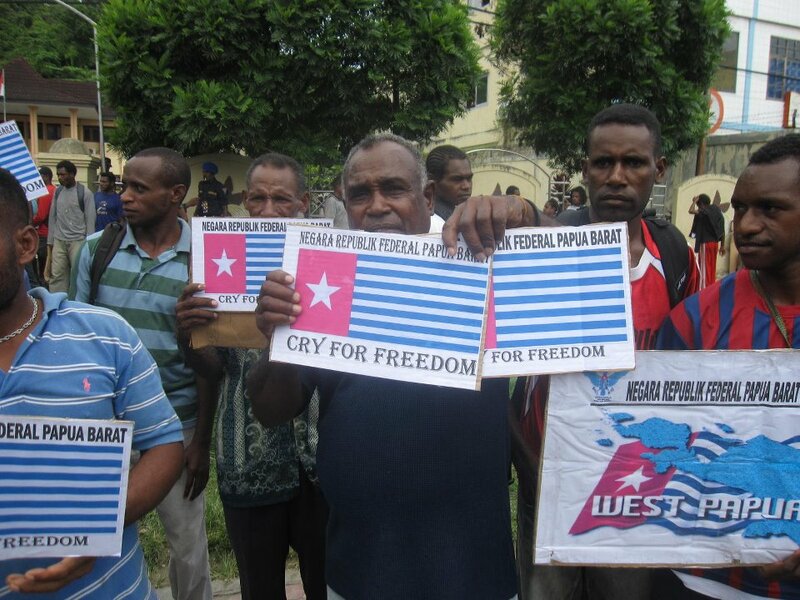 When Papuan guerrillas were blamed for shooting US schoolteachers at Freeport in 2002, the Indonesian military was able to use the appearance of a heavily armed insurgency targeting foreigners to get the US to support its militarist aims against Papuan civilians,” an Indonesian human rights worker based in Jakarta, who asked to remain anonymous, told West Papua Media today. The Jakarta Globe has reported that Civil society groups across Indonesia are also getting more suspicious about military involvement in the shooting. Poengky Indarti, executive director of activist group Imparsial, told Jakarta Globe on Sunday that 13 countries raised the issue during the UN’s Universal Periodic Review in Geneva last week, with five of them specifically questioning the government’s inability to capture those responsible for shooting civilians in the restive province. “Germany, Canada, Britain, the Netherlands and France questioned the Indonesian government on its handling of human rights violations, such as torture of civilians, shootings and killings in Papua,” Poengky told the Jakarta Globe. 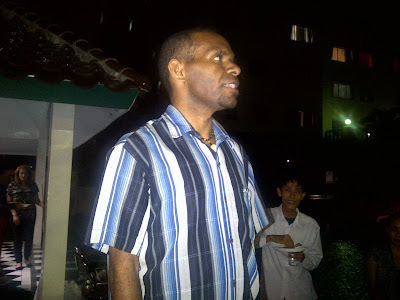 West Papuan resistance groups, both in the civil resistance movement and the armed struggle, have universally condemned the shooting of Helmut, saying it is yet another in the long list of crimes by Indonesia against Papuans and those friendly with Papuan people. KNPB had carefully assessed “that the shooting was purely (a) state conspiracy to scapegoat (the) people of Papua for the umpteenth time as the mastermind behind the violent conflict in West Papua,” explained Yeimo. 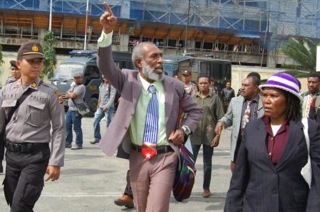 (Jayapura) The treason trial against the leaders of the Third Papuan People’s Congress in Jayapura was adjourned on Monday until February 8, after a short hearing that Indonesian authorities moved at the last moment preventing many supporters from attending. 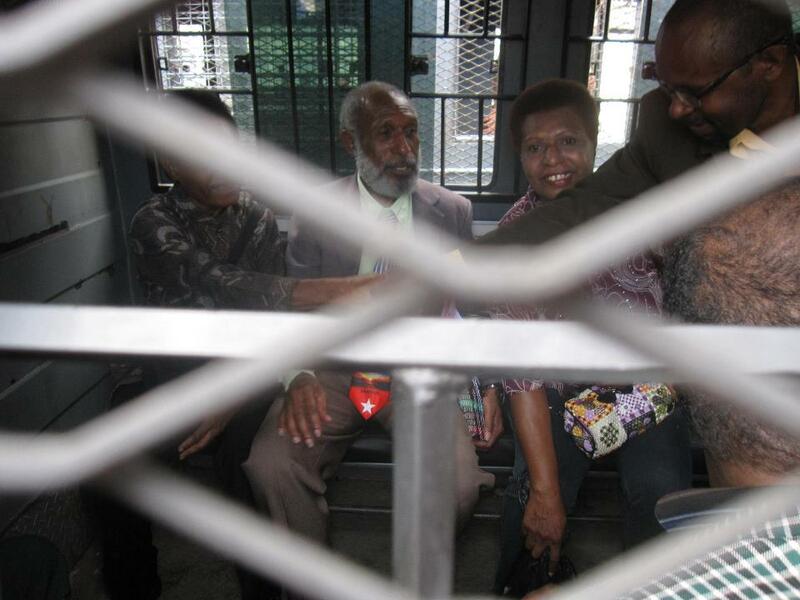 The five defendants, President of the Federated Republic of West Papua (FRWP) Forkorus Yaboisembut, Prime Minister Edison Waromi, together with Congress organisers Selpius Bobii, Dominikus Sorabut and Agus Sananay were charged with makar or treason under Article 106 of KUHP (the Indonesian Criminal Code) for their declaration of an independent West Papua at the close of the Third Papuan People’s Congress on October 19 last year. The historic Congress was violently broken up by Indonesian security forces using live fire and excessive violence, with at least seven people killed, hundreds beaten and tortured, despite official permission for the event to be held. Indonesian security officers involved were given minor disciplinary sanction, with most perpetrators of violence enjoying complete impunity despite footage of the Indonesian security force violence being broadcast internationally. Initial reports from witnesses inside the trial early in the day claimed that the team of judges argued with the defence legal team about the need to know the political position of the defendant’s, despite the fact that in a treason trial this would be self-evident. Yaboisembut and Waromi then fundamentally rejected the charges against them, arguing that their actions were not treason“. According to Forkorus as reported by the Jakarta Post, “What we have been doing is seeking our own independence. Thus, we have cheated no one,”. Forkorus argued that Indonesian occupation of his homeland was the real issue, and that ”this problem is not the problem of separatism and rebellion or treason”. Both Forkorus and Waromi said that the issue of Papua should be tried in international courts as the Indonesian state did not have jurisdiction over Papua. “Forkorus then asked for time to read a statement to the assembly to process the rejection of the law, (the request of) which was then approved by a judge. Our attorneys will do the rebuttal (exception) to the indictment dated 8th February 2012,” according to the legal team led by Hamadi. The Panel of Judges hearing the trial are Chairman of the Jayapura District Court of Class IA, Jayapura, Papua, Jack John Octovianus, SH. MH,; assisted by I Ketut Nyoman S, SH. MH. Syor Mambrasar, SH. MH. Orpah Marthina, SH. and Willem Marco Erari, SH. Outside the court hearing, almost 400 hundred heavily armed riot police and a similar number of Army and Kopassus personnel were guarding the courthouse venue from dawn (0600) with close to a dozen armoured assault vehicles, mounted with heavy machine guns, according to participants. Participants in the protest claimed to West Papua Media via SMS that security forces were acting in a heavy-handed manner, describing their actions as “wild and aggressive”. “This display of armour makes thousands of ordinary people in Jayapura traumatized and afraid to come to action,” said Jack Wainggai, the spokesman for the Prime Minister of the FRWP, Edison Waromi, on trial for treason today. 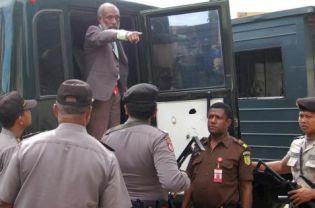 Organisers had aimed for several thousand people to attend, but amid heavy Indonesian security that discouraged solidarity protests by West Papuan supporters of the defendants, only 500-600 braved the heavy armour and “state intimidation” outside the court. Despite promises by Indonesian authorities that the trials would be open, the presiding judges secretly started proceedings at 8.30 am before supporter could arrive. In a press statement before the trial, Bintang Papua reported that Olga Hamadi of Kontras Papua said, “The five men will face charges under Article 106 of the Criminal Code for subversion. Based on past experience, there are concerns regarding security during the trial which will be open to the public, meaning that anyone wishing to attend the trial will be able to do so.” Hamadi urged all present to restrain themselves and ensure that conditions surrounding the trial are conducive. Speculation has mounted amongst local observers that the trial may be moved from Jayapura to metropolitan Indonesia to reduce any potential political flashpoint it will cause amongst pro-independence forces in Papua, with the prosecutor’s office formally warning of such a move should unrest occur. Conversely though, any shift would create more opportunities for international observers to be present at the trial, a basic condition called for by the defence and international human rights monitors. 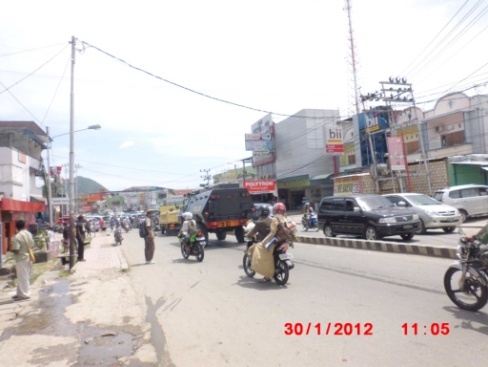 After the adjournment, the few hundred that did attend were able to disperse peacefully without an Indonesian security force crackdown, but tension still remains high in Jayapura as armed troops are still deployed on the streets the following day. 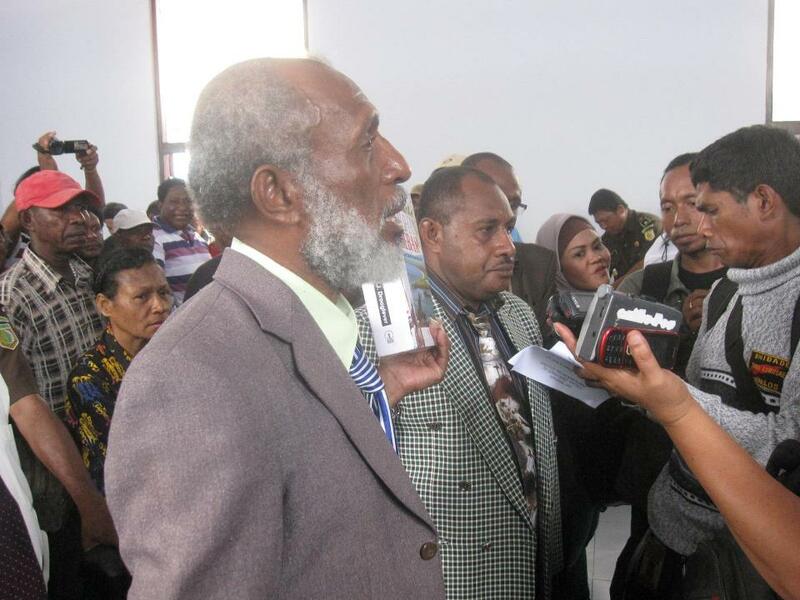 Elsewhere in Papua, solidarity actions were held with the treason trials against the Congress leaders. In Manokwari, orations were held calling for international peacekeepers to be deployed to protect West Papuan people from Indonesian state violence. Calls were also made in Manokwari for neutral international mediators for dialogue between Jakarta and the Federated Republic of West Papua. (Comment: West Papua Media was the only media outlet that covered this is detail when the story was broken (with thanks to local human rights sources and Tapol), so we also thank Jakarta Globe for following this up with such a positive result. see https://westpapuamedia.info/2011/11/05/indon-commando-btn-755-brutalise-puncak-jaya-villagers/ It remains to be seen if these soldiers from Battalion 755 are charged and put on trial for human rights abuses and torture, and face accountability for their actions. Moreover, without the identification of command responsibility for who gave the orders for soldiers to extrajudicially abuse civilians on mere suspicion of separatism (freedom of expression) then these abuses will continue. Detention at a garrison is a long way from a judicial process). Seven soldiers stationed in Papua have been detained by military police on suspicion of abusing civilians there. Col. Ibnu Tri Widodo, the head of district command (Korem) 172/PWY, said the seven soldiers were taken into custody after it was reported that they had beaten, kicked and humiliated 12 residents of Kurulu village in Papua’s Jayawijaya district. “For what they [the soldiers] did, they are being detained at the military police in Wamena,” Ibnu said. The Commission for Missing Persons and Victims of Violence (Kontras) reported that the soldiers had stumbled across the civilians participating in a traditional tribal council on Wednesday, but that the soldiers mistook the meeting for a pro-separatist gathering. The soldiers then allegedly beat, kicked and doused the 12 with water while also forcing them to crawl on all fours. Following the allegations, all military troops assigned to Kurulu have been replaced. Ibnu said on Monday that he would try to prevent similar incidents. (Jayapura) Renewed demonstrations are being held in Jayapura today demanding Indonesia take formal and legal responsibility for ongoing human rights abuses in West Papua, most recently the brutal attack on the Third Papuan People’s Congress (KP3) on October 19. In the first act of political expression since the violent crackdown by Indonesian security forces on the declaration of the Democratic Republic of West Papua (RDPB) by KP3 participants, local organisers of today’s rally have expressed concern that security forces will again resort to extreme violence to suppress peaceful dissent. 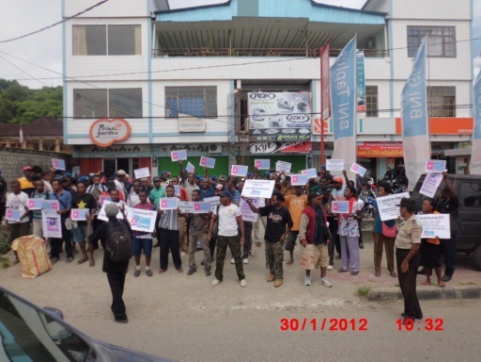 The demonstration, which started at 0900 local time in Waena, near Jayapura, is also demanding the immediate and unconditional release of all political prisoners in West Papua, including those arrested and charged with treason for organising the historic KP3 Congress from October 16-19. According to witness reports received at the beginning of the march, over 500 police are present with 300 armed riot police and water cannon shadowing the peaceful march. 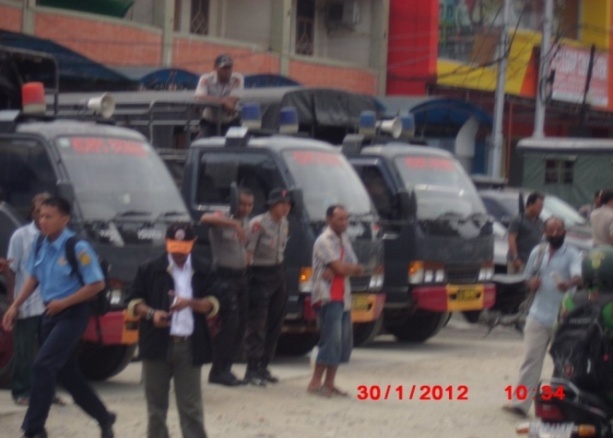 2 Corps of Brimob (2628-XVII and 2627-XVII0) and 2 SSK (Special Security Company – 150 men each ) of normal police from Polresta Jayapura are attendance, with almost a company of plain clothes police are in attendance, with armoured equipment. Over four companies of Indonesian army in full battle gear are also present. Speaking by phone to West Papua Media from Jayapura on Sunday night, a Prime Ministerial spokesman for the recently declared RDPB transitional government said that “the increased militarisation of Papua is not the solution that we wish for”. The spokesman further mentioned that Indonesia must allow a platform for us to peacefully express out views in accordance with internationally accepted human rights”. Rolling civil resistance activities have also been planned across West Papuan towns in coming days, partly to socialise the outcome of the KP3 meetings, and also to up the ante on the Indonesian state to accept the need for political change in Papua, including allowing West Papuan people to exercise their universal human right of self-determination, according to organisers. 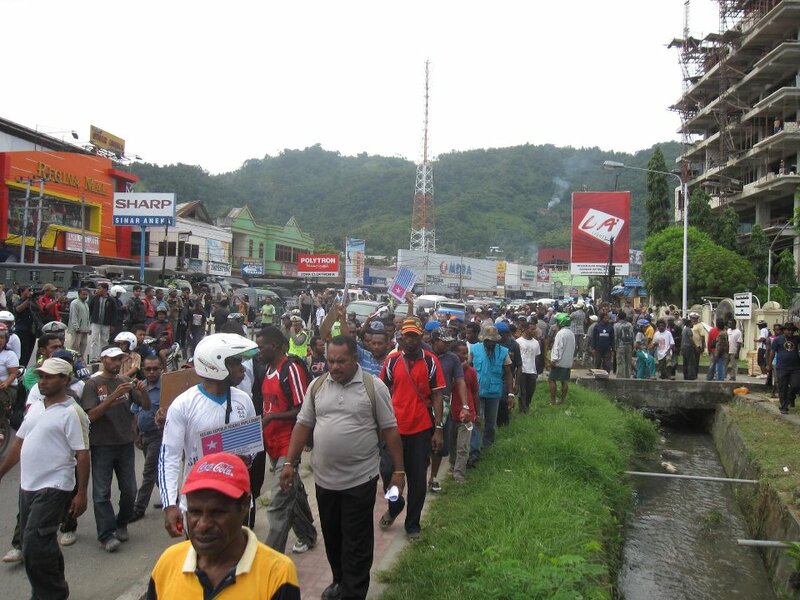 Despite brutal tactics, intimidation and nightly terror sweep operations by police and military across Jayapura creating significant tension and fear amongst the local population, people are prepared to stand for their rights and prepared to be arrested. Over 800 people were arrested by Indonesian security forces after simultaneous premeditated raids on various venues in Jayapura on October 19 after the declaration of an independent West Papua. Most of the 800 were released, with scores sustaining serious injuries from beatings and torture by security forces. Seven of the leaders of KP3remain in detention having been charged with makar (Rebellion) and Treason, accused by Jakarta of holding a coup d’etat. Evidence is beginning to emerge that the crackdown was known about in Jakarta before the declaration was made, though it is unclear at this stage who ultimately authorised the use of extreme force against unarmed Papuan delegates. Seven victims have been formally named, but local human rights activists claim that 17 people were killed by Indonesian police and soldiers, including members of the elite Australian-trained and funded Detachment 88 counterterrorism unit. Over a thousand people are still in hiding, including many with significant untreated injuries meted out by security forces during the simultaneous attacks on Congress . Organisers of today’s rallies are expecting several thousand people to attend the event in Jayapuras, starting in Sentani (about 25 km outside Jayapura) and then via a long march to Waena, to finish outside the DPRP, the Papuan Provincial Parliament. According to organisers, Jayapura area Police have granted permission for the march and demonstration to go ahead but it is unclear at this stage if a crackdown will occur. It is unclear whether Jakarta is going to call for restraint of its security forces again, or if they once again will kill people for engaging in peaceful free expression. 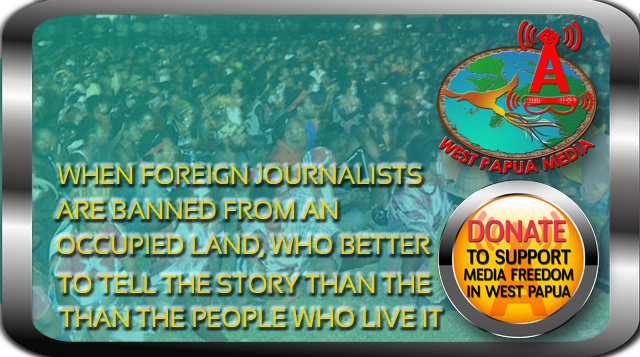 This is a developing story that West Papua Media will continue to monitor closely – please stay tuned.